Excellent baked goods made from corn variations sold from carts, franchising within Metro Manila. CORN A-HA! Is a new and innovative concept in corn made from original recipes using the freshest and finest and finest ingredients to form a delicious variety of corn products that are not only healthy, but nutritionus and ideal for today's fast-paced and health conscious society. CORN A-HA! Is not merely a product concept but a result of the owner's passion to create a healthy type of fast food without compromising taste, quality, or health benefits. 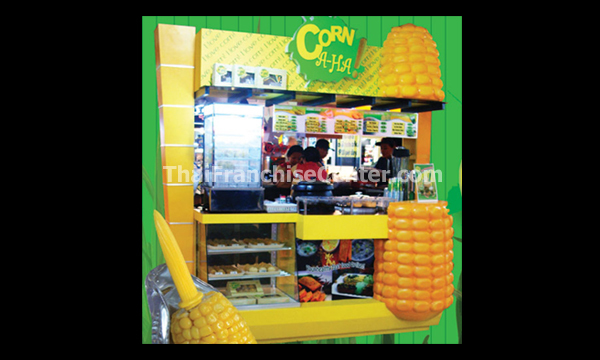 From our mouth-watering Corn on the Cob and Sweet Corn Kernels with flavorful sauces, irresistible Corn Muffins, Corn Pudding, Chili Corn Bread, delicious Puto Mais with Cheese and Delightful Ginatan Mais, to our refreshing line of cold beverages which include our Very Corn Shake, Icy Corn-Gatan and Mais-Gulaman Cooler, these sumptuous products are distributed and sold through customized food carts within Metro Manila. Customers can now enjoy this wonderful creation that sets us apart from the competition. Our unique concept really puts the "A-ha" in our Corn! Required Space : 4 sqm. Address 24/7 Sunrise Enterprise Inc., Unit 5L Midland Park Manor II Condominium, Ortigas Avenue., San Juan City.